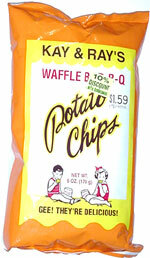 Taste test: These are good rippled barbecue chips. They're on the sweet side, with quite a bit of sugar, and they've got a good taste. The "waffle" name threw of some people off, as they were expecting something completely different, rather than ripple chips. Smell test: Sweet barbecue smell.